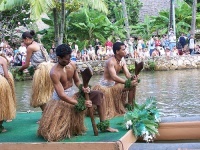 Hawaii's top tourist attraction, the Polynesian Cultural Centre, is situated on the Kamehameha Highway in Laie on the scenic north shore of Oahu island. This remarkable venue, visited by more than one million people a year, consists of seven Polynesian 'islands' in a beautifully landscaped 42-acre setting, representing Samoa, New Zealand, Fiji, Hawaii, Tahiti, the Marquesas and Tonga, all situated in a freshwater lagoon. The centre gives visitors a holistic insight into the culture of the different Polynesian communities, employing students from the nearby Brigham Young University-Hawaii campus to bring various activities, from pageants and ceremonies to tribal tattooing demonstrations, to life. A highlight of a visit to the Centre is the evening show spectacular, 'Horizons', presented in the 2,770 seat Pacific Theatre with its multi-level stages allowing for fiery volcanoes and brilliant fountains to erupt as special effects in this huge Polynesian song and dance revue. Opening times: Monday to Saturday 12pm-9pm. Closed Sunday. The box office is open 9am-8pm. Admission: General admission: $89.95 adults, $71.96 children (5-11). Visitors can select either a single component of the Polynesian Cultural Center experience, or a packaged combination of several options.